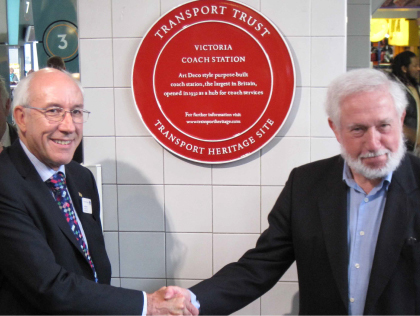 The Red Wheel Scheme was created by the Transport Trust to recognise and commemorate the most significant sites of historical importance to transport heritage in the United Kingdom. The Transport Heritage programme commemorates Britain's rich and globally important legacy in the development of transport. Our aim is to present a comprehensive overwiew for each site, in a way that will attract a new and wider audience. The most significant of these locations are marked by erecting a Transport Trust Heritage Plaque or “Red Wheel” on the physical site. You can use the extensive search functions within this website to locate sites of greatest significance. To date we have placed 100 Red Wheels around the UK. As well as the Red Wheels sites, this website has a searchable database of over eight hundred interesting Transport Heritage Sites which can be readily visited and inspected. Many represent an extraordinary technical or engineering leap from the then recieved wisdom, and are a source of pure wonder. To be listed on our Transport Heritage Sites website database, the building(s), artefacts or general site has to be shown to have special value within their general category; for architectural reasons; as an illustration of progress in social or economic history; as involving technological innovations; for their associations with particular individuals or events; or for their group value.